You may already be using predictive maintenance (PdM) techniques on your motors and drives. But how often do you inspect the power to your equipment? By adding basic power quality measurements to production equipment maintenance procedures you can head off unexpected failures in both production equipment and your power system. • Cost of damaged equipment and materials, including repairs, replacements and scrapped material. To calculate power quality costs and potential savings at your facility, reference the online calculator at www.fluke.com/pqcalculator. Good voltage level and stability are fundamental requirements for reliable equipment operation. 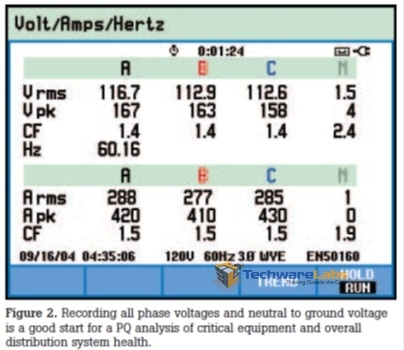 • Running loads at overly high or low voltages causes reliability problems and failures. 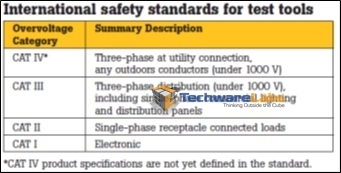 Verify that line voltage is within 10 % of the nameplate rating. • As connections in your system deteriorate, the rising impedance will cause “insulation resistance drops” in voltage. Added loads, especially those with high inrush, will also cause voltage decline over time. The loads farthest from the service entrance or transformer will show the lowest voltage. • Neutral to ground voltage tells you how heavily your system is loaded and helps you track harmonic current. Neutral to ground voltage higher than 3 % should trigger further investigation. Taking a single voltage reading tells only part of the story. How is the voltage changing during an hour? During a day? Sags, swells and transients are short-term variations in voltage. The voltage sag (or dip) is the most common and troublesome variety. Sags indicate that a system is having trouble responding to load requirements and significant sags can interrupt production. Voltage sags can cause spurious resets on electronic equipment such as computers or controllers, and sag on one phase can cause the other two to overcompensate, potentially tripping the circuit. Sags have several dimensions: depth, duration, and time of day. Utilities use a special index to track the number of sags that occur over a period of time. To gauge the depth of the sags, they count how often voltage drops below various thresholds. The longer and larger the voltage variations, the more likely equipments are to malfunction. For example, the Information Technology Industry Council (ITIC) curve specifies that 120 V computer equipment should be able to run as long as voltage does not drop below 96 V for more than 10 seconds or below 84 V for more than 0.5 seconds. Current measurements that trend upward are a key indicator of a problem or degradation in your load. While equipment is running, monitor phase, neutral and ground current over time. Make sure none of the currents are increasing significantly, verify that they’re less than the nameplate rating, and keep an eye out for high neutral current, which can indicate harmonics and unbalance. In a three-phase system, significant differences in phase voltage indicate a problem with the system or a defect in a load. • High voltage unbalance causes three-phase loads to draw excessive current and causes motors to deliver lower torque. • Unbalance is tracked in percentages (see Figure 3). The negative sequence voltage (Vneg) and zero sequence voltage (Vzero) together identify any voltage asymmetry between phases. • Using a power quality analyzer to do the math, high percentages indicate high unbalance. EN 50160 requires Vneg to be less than two percent. Harmonic distortion is a normal consequence of a power system supplying electronic loads such as computers, business machines, electronic lighting ballasts, and control systems. Adding or removing loads from the system changes the amount of distortion, so it’s a good idea to regularly check harmonics. Harmonics cause heating and reduced life in motor windings and transformers, excessive neutral current, increased susceptibility to voltage sags, and reduced transformer efficiency. As current harmonics interact with impedance, they’re converted into voltage harmonics. Total Harmonic Distortion (THD) is a sum of the contributions of all harmonics. By tracking Voltage THD over time you can determine if distortion is changing. 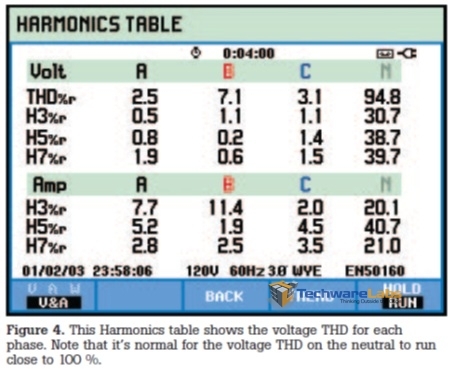 For voltage harmonics, IEEE 519 recommends less than 5 % THD. To know more about power quality tools, visit Fluke Corporation, India. Would you recommend all non-linear loads (rectifier based loads) be on dedicated non-linear load designed supply circuits to avoid possible harmonic distortion damage to linear loads (ac motors, transformers, etc. )?